Since the first flash of a projectile from a barrel around 1000 CE, the gun has had a rich and varied history across most all avenues of life: social, economical, political, and creative. It also has the power to divide people and opinions like no other tool before or since. Let’s be clear: a gun is a tool. It is specifically designed to make easier the task of killing, of human or other animal. Now, one can certainly use a gun to accomplish goals besides killing – say, destruction of a barn wall, for those not well-versed in the skill of shooting a target – but their primary function is to kill, with more power, speed, and accuracy than any other weapon (assuming said gun is in the hands of an expert). I didn’t grow up around guns, but I had my share of toys for games of ranchers and rustlers with the boys next door, and I talked about them a lot with my father, who’d been an Army sergeant in Vietnam and who’d had an intense respect for firearms and war weaponry in general throughout history. He’d impressed upon me at a young age that guns are dangerous, doubly so if they’re not handled with respect. As I got older, we delved into the specifics of them: “I would much rather you know how to properly use a gun and never have to,” he’d say to me time and again, “than find yourself in a situation where you had to use one but didn’t know how.” He never squelched my interest in them, but he always made sure I understood the inherent danger in them, and the enormous responsibility a person has whenever they pick one up. I’d written stories with characters who’d used guns since I was a kid: Han Solo’s DL-44 heavy blaster pistol, the Enterprise crew’s type 2 phasers, my D&D-inspired thief’s flintlock pistol. In those early forays, guns were simply weapons of convenience that often made a cool noise or shot a bright laser beam, and I didn’t think much about their impact (pun not intended). It wasn’t until a few years ago, when I wrote the gunsmith in From Hell (A Love Story), that I really thought about what I was saying about guns through my stories when my characters squeezed a trigger. There’s a semi-pivotal moment in the story where this gunsmith and the main character argue about throwing blind cover fire into a crowd of civilians. The gunsmith’s argument is that they’re surrounded by people, while the main character points out, “Yeah, and at least one of them is shooting at us.” The ramifications of their choices follow them through the rest of the book, but it was important to me that both of them realize: odds are good that when you pull out your gun, people will die. Because I’d grown up being taught to respect – not fear – guns, I wanted that respect to come through in this story. 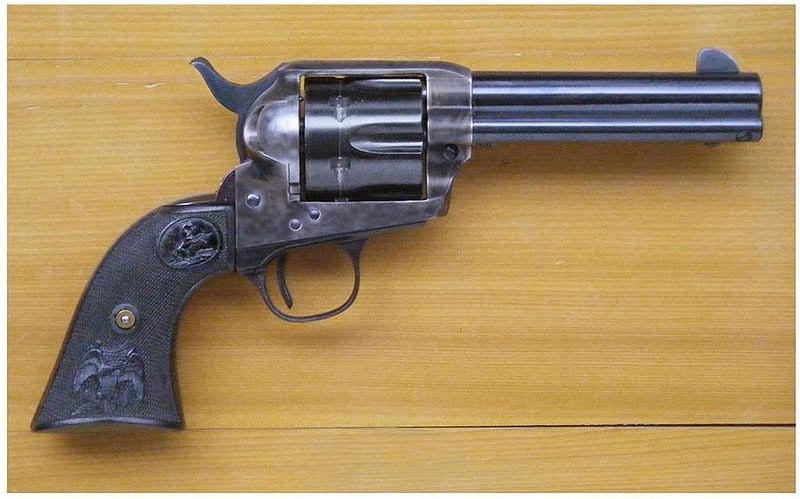 Even in the books and stories I was reading to get a feel for a dirtier galaxy based on the Old West, the characters treated their guns like the closest partners they’d ever have, which was probably pretty close to the case in those wilder frontier times. Stories are not soapboxes, though, and it can be difficult for a writer to separate their personal views from those presented within their prose. Firefights offer great opportunity for excitement, high action, and conflict. But a quick-trigger topic like gun use (ha ha) requires at least some responsibility on the writer’s part. Like any weapon, they’re dangerous, and our stories would lose a measure of realism without addressing just how dangerous they can be. We can do this through the actions, reactions, thoughts, and dialogue of our characters, as well as offering realistic depictions of what happens when those characters use their firearms without awareness, caution, or respect. Have you ever written a gunslinger? What do you think about guns – or any weapons – in stories? While realism is important, how much do you think a story requires to be seen as effective in its telling? I have never written a gunslinger, but the MG novel I’m working on now deals quite closely with guns in a community, and how easily accessible they are. While I’m alluding to the issue of gun rights, I don’t want to be preachy — as you say, I don’t want to use my novel as a soapbox. What’s wonderful about fiction is that, as long as you do it right, you can get your message across without slamming people with it. Sounds like you have a strong handle on how to treat guns in your writing. I really like the examples you provide, showing how your characters deal with them while being careful to not turn your story into a political or social stage. It’s hard to do, but once you find that groove, it’s so worth it! I have to agree with you on how guns are tools and that we have a responsibility when it comes to their use. As for writing with guns or any sort of weapon, I think I’ve always figured that my characters had a good sense of when it is appropriate to use them and how to do so. Personally, I prefer stories that do have some fights with them, guns or other, as I do like having action here and there. As for how realistic I get when dealing with weapons, I want to say that it depends on the characters. Teenagers in a suburban setting might not think too much about what they’ll do with weapons until the time comes for them to use them, as if it’s all a game until it’s time to honestly fight someone and potentially take a life. Ancient warriors would most likely have a better understanding of what they’re doing with their weapons in order to protect their country or their king, and perhaps, war is just a part of their lives. I may have missed the mark there, but I think that realism for a story depends on a story. Harry Potter dealt with death and wounds, using wands that could both assist, heal, and maim. Pretty intense for a kids’ series, huh? As long as the realism functions for a purpose in the story, perhaps, like a character struggling to come to terms with having to fight another human being. Great post! This one got me thinking quite a bit about how I introduce and use weapons in stories. I think your perspective on the realism of action in a story, and how it relates back to the characters as well as to the reader, is a good one, spooney. Your stories have always had a level of realism to them. The issue I take with the depiction of weapons in popular entertainment like TV shows and movies as well as some books is that there is often very little repercussion for the action of squeezing a trigger. Guns in particular give the user an inflated sense of security and/or power that’s often unfounded, especially in the hands of an amateur, or someone who is used to having superior firepower. What’s important to me is that we, as the creators of such fictions, perform our due diligence and help our readers and viewers understand that actions have reactions. Sometimes, they’re for the best, and sometimes, they come back to bite us. Guns are problematic for me because I’ve always had a strong reaction to them, even as a child. Loud, sharp sounds and explosions send me jumping a mile high. They always have. I could only watch fireworks as a child with my fingers firmly in my ears. Even today, I have to consciously keep my hands away from my ears on the 4th of July. And if a cannon is supposed to go off at a historical site, I’ll do my best to be somewhere far away. So you can probably understand that I’ve never handled a gun in my life and have had absolutely no desire to do so. But if I’m reading a piece of fiction where they’re used, I’m okay with it. As long as they’re appropriate to the story and the characters. Which, actually, is how I feel about most objects that enter a story. Your reasoning makes sense. One thing that I really enjoy about your mystery/adventure stories is that you’re able to create so much tension WITHOUT having characters wield high-power weaponry. It’s been interesting for me to write in a universe where guns are very common, since I’ve spent so much story time prior to this in relatively tame worlds of romantic and/or family drama. I do have one character in my sci-fi Old West, though, who refuses to use firearms, for the simple reason that “They go off.” So, evaluating deeper reactions and personalities even in that universe has been a lot of fun. Thanks for stopping by. I hope your own writing is going well! Personally, I’ve always been a fan of the gunslinger. So many times, they are the rogue, the outlaw, the anti-hero or just all around loner and I think there is a small part due to the nature of their preferred tool. A gun has a majestic mercilessness to it, because it does not care what is in it’s path. A sword you can twist so your opponent is only stunned by the broad edge, so a kill becomes an intimate affair. An arrow, even a modern one, will never have the ballistic power behind it that a bullet will, but a quill and a holster carry the same message in the right hands. Still, if there’s one trait common to every gunslinger I’ve seen, it’s respect for the weapon. If you carried it, you trusted it to get you though, since you knew that someone else was doing the same on the other side of the line. That’s where realism can come into play, depending on the storyline. You can trust your weapon through hell and back, but if she has no bullets left, then you might just be carrying another person’s trophy. Thanks for stopping by! I’m always grateful to hear what others think about my ramblings. I think weapons have a place in storytelling. I remember reading somewhere about how someone just put a gun in the room and it immediately created tension in a play. Weapons are symbolic and powerful in storytelling.